Adam Sa ndler (born September 9, 1966 in Brooklyn, New York) is long time ago over thirty. But his filmography is 80% of the comedies, and he is mostly playing as an easy-go and infantile guy. Many people think that he is the same in real life as well. But in fact, Adam Sandler is an exemplary family man and a huge animal lover. It turned out that Sandler was very found of dogs since his childhood. The first actor's dog, charming brindle bulldog named Meatball lived with Adam for a long time, and was a witness to all the ups and downs in the life of a movie star. Meatball passed alongside with his owner the main path of a men's life - the path from a bachelor to a family man. In summer 2003 Adam Sandler married to an actress Jacqueline Samantha Tython. 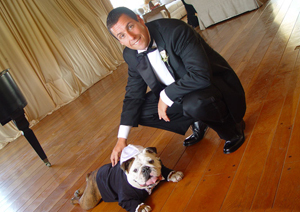 At his owner's wedding Meatball was dressed in a black suite and the dog was - in Sandler's eyes - perhaps the most honored guest after his parents and close friends. Soon after the wedding the newlyweds purchased another bulldog, and Adam Sandler has once again demonstrated his inexhaustible sense of humor, naming a new pet Matzoball. Matzo is a flat, unleavened Jewish bread. As you know, Adam Sandler was born in a Jewish family, he professes Judaism and Jacqueline Tython also adopted this religion before the wedding. So now Adam Sandler is a happy family man, the father of two adorable daughters and the owner of several four-legged pets. Sandler loves to tell stories about how his dogs. After the birth of Adam's second child his bulldogs became jealous of the kids, because his pets were accustomed to getting the undivided attention of the owner! "The same trick Matzoball repeated every day: he was watching my daughter playing with some toys ... The next day we would find these exactly toys, torn to pieces and smeared in dog's saliva!" - Complained Adam. But really he can never be angry with his pets.